Time Warner Cable launched their Remote DVR Manager service in five markets this week, with more areas being added soon. The service allows TWC subscribers to manage DVR recordings via browser-enabled mobile devices or PCs. The service was launched in the Carolinas region, Northeast region, New York City region, San Antonio, Texas, and San Diego/Desert Cities. Some features of the DVR Manager include search by title, person, keyword, genre or channel rating, view/cancel/modify scheduled recordings, access real-time record confirmations, and renaming of multiple DVRs. By October 29th, the Remote DVR Manager should be available to customers in El Paso, Austin, Corpus Christi, Laredo and the Midwest (excluding NE Ohio and Green Bay). Dallas is also expected to receive the service during the 4th quarter this year. 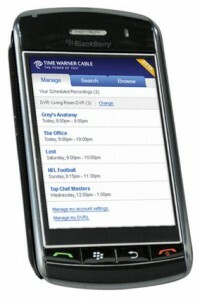 For a tutorial of the remote scheduler, visit the TWC corporate blog. finally Time Warner is doing what Comcast, Uverse, & Directv has been during for like a year or more now.